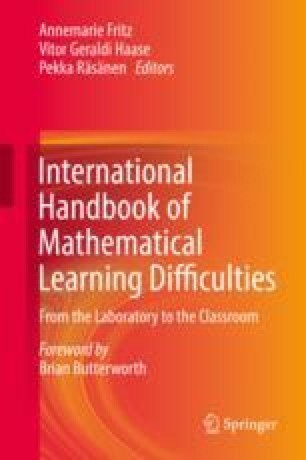 This chapter aims at describing dyscalculia, based on definitions from the WHO and DSM, and how behavioral experts can examine whether a low-performing student in math has dyscalculia or not. Based on a protocol for dyscalculia, three criteria, which must be met in order to diagnose dyscalculia, will be described. Five steps of conducting process research will be described in terms of the learnability of students. Because prevention is more promising than remediation, early education will be highlighted as an important moment to start helping young children in mastering math prerequisites, so they can start grade 1 without any big delay. Tim saves for a new drum set. He has already saved € 623. The drum set will cost € 1017. How much money does he need to” have to save more? Tim has to pay € 1017 for a new drum set. Tim already has € 623. Tim has to pay € 500 for a new drum set. Tim already has € 350. How much does he needs? How much money does Tim have? What is the price for the drum set? Does he have enough money to buy the drum set? How much more money does he need? Giving material help .Presenting the task with help of a picture (see Fig. 38.2). As you can see, Tim has € 350. The price of the drum set is € 500. What is the difference between 500 and 350? Which sum is connected with this problem? How much more money does Tim need? What is the answer for this sum? Tim has already € 350, but the drum set is € 500. The drum set is more expensive and therefore Tim needs more money. The question is how much money does he need. This is about the difference between 500 and 350. I make, for example, a picture of the number line. I write down 350 and 500. The problem is solvable by counting from 350 to 500. First I am doing plus 100 that makes 450 and after that another 50 makes 500. The answer is 500 minus 350 makes € 150. Tim needs € 150 more. The drum set costs € 800. Tim has already € 363 saved. How much does Tim needs more? The drum set costs € 1000. Tim has already € 360 saved. How much does Tim needs more? When this was going well, then you can return to the original task. If a more easy math task has been done without a good result (in one of the phases of help), more comparable and a little bit less complex tasks can be given. The drum set costs € 300 and Tim has already € 200 saved. How much does Tim needs more? With this more easy task, the same levels of help will be followed.